We have always been interested in big trees, and have planted several (4) Giant Sequoias (Sequoiadendron giganteum) outside where we live in Indiana, only to see all of them die. 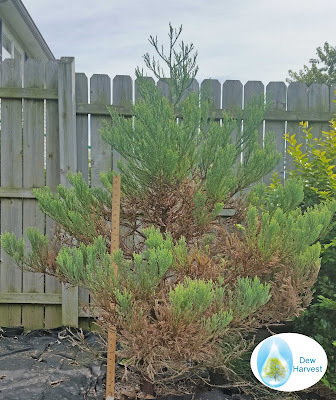 When we started Dew Harvest® LLC, we decided to use one Groasis Waterboxx to plant a Giant Sequoia, hoping that the Waterboxx would overcome the dry Indiana summers that killed my previous 4 trees. The Sequoia is very water loving, and does not tolerate long periods of drought. Below you see pictures of both the Sequoia immediately after planting in mid May and progress since then 6 weeks later (for reference, the lid of the Waterboxx is 20 inches in diameter). 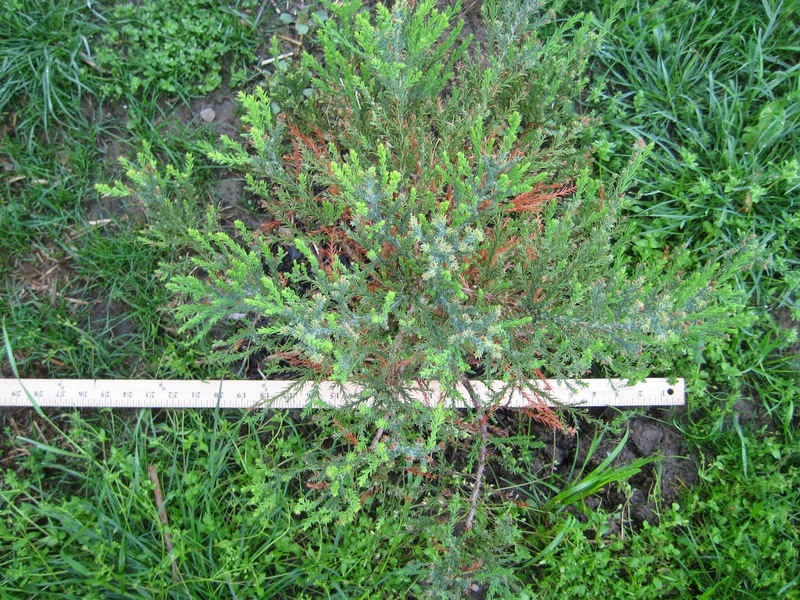 The Sequoia seen laterally at initial planting (again approximately 2 years old). Some brown is evident from winter die back. Sequoia after 6 weeks growth with the Waterboxx (almost doubled in size) while the grass around the Sequoia has died back from lack of rain. No water was added to the Waterboxx except that added by dew and rain naturally. Note: Orientation of photo is flipped 180 degrees as evidenced by blue cap in Waterboxx lid position. The lighter blue green color is indicative of new growth. 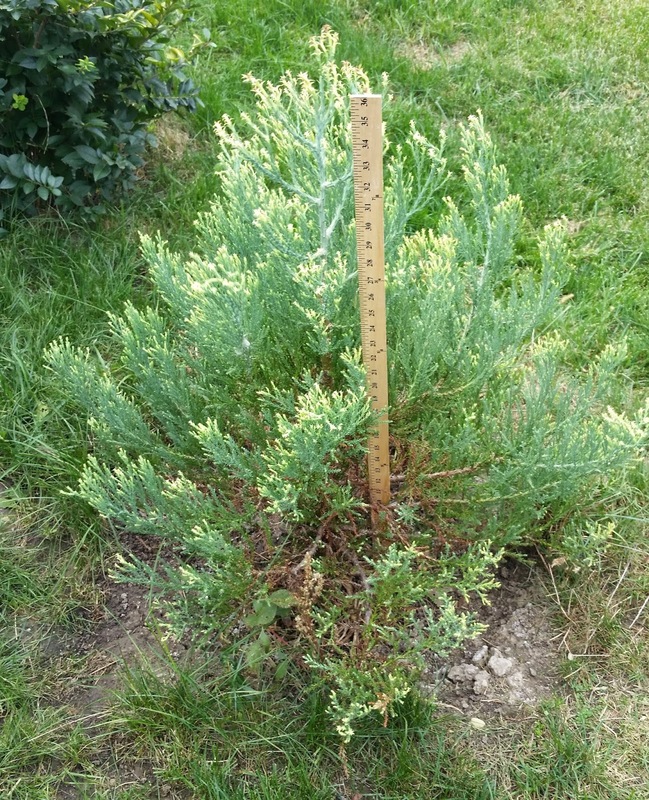 The Sequoia after 6 weeks with the Waterboxx (approximately doubled in size in 6 weeks, after 2 years of slow growth). Again, the grass around the Groasis Waterboxx is dying back from lack of consistent rainfall. Again, the lighter blue green is new growth, and no brown is evident. 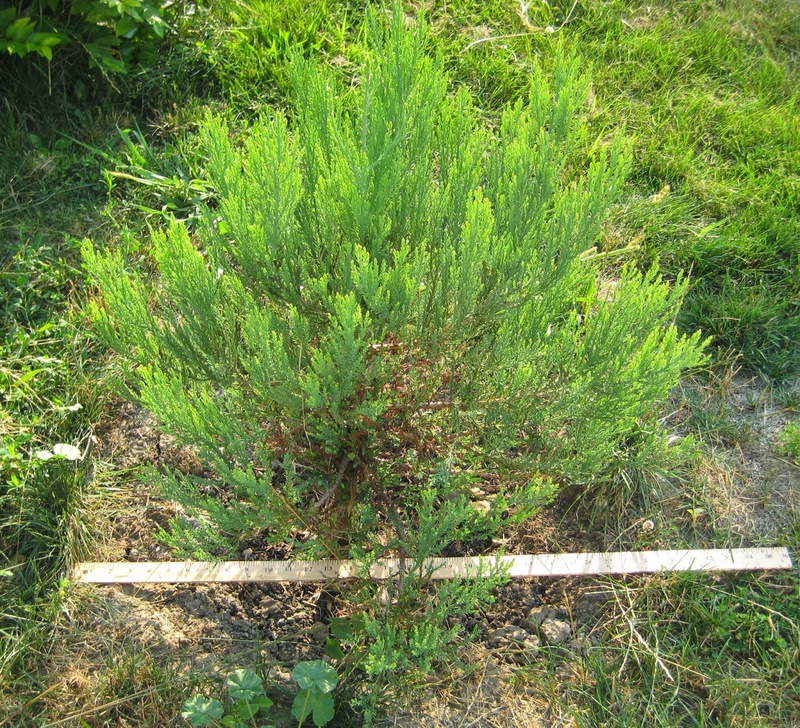 The Sequoia after approximately 2 months, continues growing in height as well as width. The large amount of light green indicates the rate at which the tree is growing. The box will be left on over winter, as it provides a blanket of water which will only slowly change temperatures and protect the base of the Sequoia from drying out. The design of the Waterboxx means that it will not break when the water in it freezes, but may loosen the lid (the ice will expand upward, not outward). Sequoia after approximately 2 months of growth with the Waterboxx and no external watering (no water has been added to the box except dew and rain, which have kept the box completely full). You can see that the surrounding grass continues to die back from lack of water, but the irrigating and cooling effects of the Waterboxx keep the sequoia growing without any browning. This tree will soon be able to grow on its own, but we will leave the Waterboxx on it over winter to prevent the drying winter winds from killing the young tree. The Sequioa 3 months after initial planting with the Waterboxx. The tree remains green even though the surrounding grass has died from lack of rainfall. Besides a very dry summer, we had the harshest winter in living memory. Just as the Waterboxx provides consistent sustaining water in the summer drought, its basin protects the trunk of the tree from drying winds. The image below shows the Waterboxx on January 10, 2014, during the Polar Vortex (with temps down to -13 degrees Fahrenheit). As you can see, the Waterboxx is wonderfully effective at growing water loving trees (or trees in dry areas) even if there is not enough water to sustain such plants as grass. The Waterboxx accomplishes this by storing dew, collected almost every night, in its basin and slowly releasing it through a wick into the soil below. The basin serves as a type of plastic mulch, preventing evaporation of the water during the day. The Waterboxx will need to be removed before the Sequoia is too large to fit through the central opening, which will likely be next spring. The Waterboxx can stay around the tree overwinter, and will not break if the water inside it freezes. In this way, it will also form a blanket for the Sequoia, which is susceptible to drying winds (most experts advise burying the Sequoia in straw in the winter). 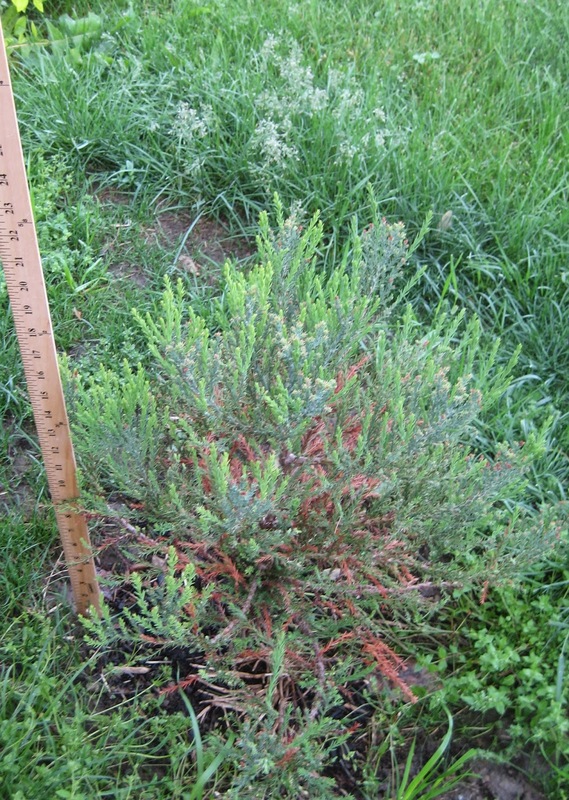 The images above show the health, size, and continuing growth of the Sequoia in the late spring, approximately one month following removal of the Waterboxx. The Sequoia generally browns out in early spring (see brown above) only to add significant new growth later that same season. The Sequoia is now ~2 feet tall (23 inches) and about 20 inches wide in this photo. This photo was taken on July 18, 2014, 3 months after Waterboxx removal. This Sequoia has not had any irrigation or artificial watering of any type (it did have a pan around it, not shown in this picture, to funnel water to the base). It is now almost 30 inches wide and about as tall. It clearly will survive now due to the deep Waterboxx induced roots. The Sequoia is seen above on October 4, 2014. Here you can see it is over one yard tall now (about 38 inches in total height. It has continued to have new growth throughout the late summer. The tree, of course, continued to grow, all without any manual watering. Below, we show it in September, 2016. The browning of the lower limbs is normal - lower limbs die off as they receive less sunlight. This tree has less sunlight than most as it has a fence immediately to its south. Growing up in Indiana (where the tallest tree is rarely 100 feet tall), we became intrigued with the idea of Sequoias that can grow 300 feet tall and live for thousands of years. We were disappointed with our consistent failure to establish one of these trees - until we tried the Waterboxx. We now hope to be able to establish small woods with Sequoias, sequestering carbon and adding incredible beauty to our Hoosier landscape. Be the first in your area to start growing trees (including perhaps Sequoias) with the Groasis Waterboxx. As always, you can learn more about the Groasis Waterboxx and buy one (or several) at Dew Harvest® LLC. You can see all our blog posts about planting trees with the Waterboxx here. We buy our Sequoias from our friend Joe Welker at Giant-Sequoia.com. We would love to hear your comments below - to leave one, please click on "Comments". If you would like to learn how to grow trees and plants in your garden without watering with the Waterboxx, the best resource is the book The Waterboxx Gardener: How to Mimic Nature, Stop Watering, and Start Enjoying Your Garden available here on Amazon.com.